If you're missing teeth, you might want to consider getting dental implants. Dental implants are artificial tooth roots that are surgically embedded into the jawbone and gum tissue. Once the implants have fully fused with the structures of the mouth, they are able to support various restorations with a level of stability that is comparable to your natural teeth. Dental implants can be used to replace a single missing toot or multiple missing teeth. The Harlem Center for Aesthetic Dentistry has helped countless patients throughout New York through the use of implant dentistry. Let's compare single-tooth and multiple-tooth restoration strategies. For people missing a single tooth, a dental implant can easily be placed in the tooth gap. Over the course of a few months, the implant will merge with the jawbone and be ready to support a single dental crown. An implant-supported dental crown is similar to a traditional dental crown, though it's fashioned to cover an abutment rather than someone's tooth structure. The crown is carefully custom crafted to ensure it looks natural and that it fits properly in the tooth gap. Dentists and dental lab technicians will also make sure the crown comfortably makes contact with the tooth or teeth of the opposite dental arch. When you are missing multiple teeth or all of your teeth, the ideal implant dentistry solution is to use multiple dental implants to support a bridge or a denture. The same principles of the single-tooth replacement apply, though different restorations are used. Will I Get a Bridge or Denture? The right option will vary from patient to patient. The extent of the patient's tooth loss determines the right implant-supported appliance. 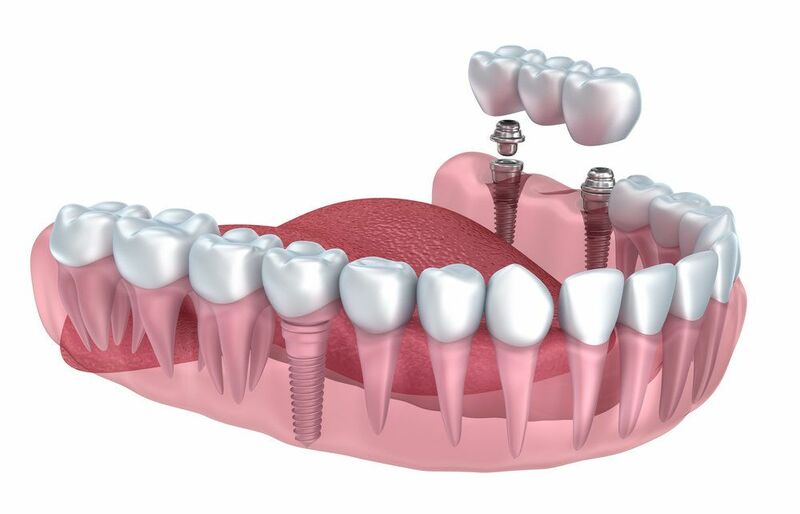 A person missing two or three teeth would be ideal for an implant-supported bridge, for instance. A person missing five teeth would be an ideal candidate for a partial denture. When a person is missing most or all of their teeth, a full denture is most ideal. How Many Dental Implants Will I Need? As you might have guessed, the number of implants will depend on the type of implant restoration used. A dental bridge will require one or two implants. A partial denture may require two or more implants. Full dentures can sometimes be supported with just four strategically placed dental implants, though more may be necessary. During the consultation process, we can determine the ideal number of implants as part of your treatment plan. If you're interested in dental implants and would like to learn how they can restore the health and beauty of your smile, we'd love to see you in the office for a consultation. We can answer your questions and address your concerns, and generally help you make the best decision based on your dental care needs. For more information about dental implants and if they're an ideal solution for you and your needs, be sure to contact our team of cosmetic and restorative dentistry experts. We look forward to discussing these matters with you in greater detail and helping you smile with renewed confidence.